What is my guitar worth? While we do not conduct valuations or appraisals, we may be able to help you determine the value of your instrument. The Official Vintage Guitar Price Guide offers research-based values for vintage and newer instruments, amps, and effects. It also has a list of dealers nationwide, many of whom offer an appraisal service. Order now, read the reviews, and sample pages of the The Guide! How do I place a classified ad? DEADLINE for submission is the 10th of each month. VG Classifieds are FREE for VG subscribers. Start a subscription for just $24.95 and submit your FREE listing! Non-subscribers must pay $50.00/listing. Submit a Classified at https://store.vintageguitar.com/classifieds-submission.html or contact Rachel at Rachel@VintageGuitar.com or 1-800-844-1197. How can I carry VG in my store? 5-Pack and Box of 6 were designed by the Vintage Guitar team with store owners in mind! 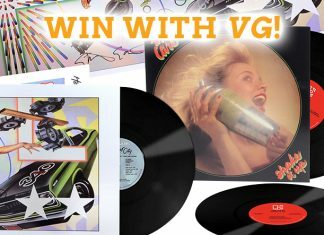 Be the coolest music store on the street with our hassle-free ways to stock VG’s fine products! Can I purchase back issues of the magazine? Shop online in the VG Store or call (800) 844-1197 to place an order with a person. I have a photo/letter I want to share. How do I get it to you guys? We love receiving our readers’ feedback and stories! See Reader Mail or Readers Gallery below. If you would like to submit a story idea, pitch a freelance submission, or suggest music or gear for potential review, please contact us at ward@vintageguitar.com. • Reader Mail • Send letters to ward@vintageguitar.com or mail to: Vintage Guitar, Inc. Attn: Reader Mail, PO Box 7301, Bismarck ND 58507. • Readers Gallery • Send your photos to: ward@VintageGuitar.com or mail to: Vintage Guitar, Inc. Attn: Readers Gallery, P.O. Box 7301, Bismarck, ND 58507. Readers submit photos with the understanding that they may be used in any VG, Inc. project. Due to the volume of photos we receive, we are unable to return them, please do not send us your only print. If you experience any difficulty registering, accessing a page, or completing an order, please contact us using this form. Simply submit this form and the VG Subscription Manager will be in contact with you ASAP. Contact info: 800-844-1197 (domestic) • 701-255-1197 (foreign) • VGuitar@VintageGuitar.com. Please do NOT email vintageguitar@pscpublink.com or subscribe@vintageguitar.com as they are deleted accounts. Next articleHow do I offer my product for review?